I have another project that I created using the Decor Elements sheets to share with you today. I picked up a clear plate from IKEA and a candle holder from a dollar store to create this cute duo. The die cut used is the Island Floral die (118871) from the Summer Mini. Tip: Apply the vinyl on the bottom of the plate so that you can easily clean and wipe the top of the plate. 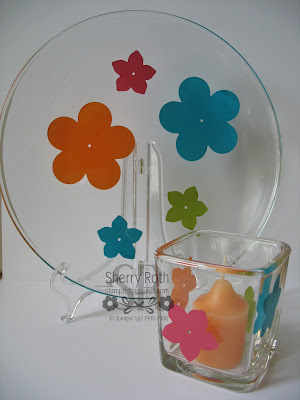 I decorated several of these little votive holders for my tropical hostess event next week. I think they will be cute accents throughout the room. You can whip these up so quickly! They would also make great teachers gifts with a box of scented votives. Blog Candy Winner - Jodi Schott - I will pop the prize in the mail for you tomorrow Jodi!